Blue polyethylene co-polymers from the Raritan Bay were caught up in a >500um mesh by the NJ Sea Grant Project, led by Dr. Nicole Fahrenfeld. Just over a century after the invention of the first plastic compound, the world is waking up to the fact that plastics will never go away -- they might be swept up onto coastlines, end up in the stomachs of wildlife, or more commonly, get shredded and weathered into increasingly microscopic pieces that pervade our air and water. 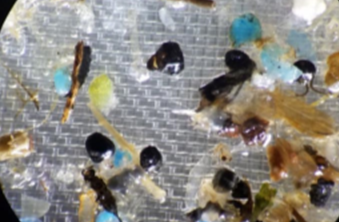 The conference on “Impacts of Microplastics in the Urban Environment”, which convened at Rutgers on March 28-29, tackled this huge environmental problem at the smallest, most microscopic level - specifically: any plastic measuring less than 5 mm. These fragments, industrially-generated pellets and fibers are too often overlooked in the general outcry against the growing plastic trash problem. They don’t have the visual impact of the Great Pacific Garbage Patch, or the tides of plastic pollution that are killing some of the world’s rivers. With that, the panelists and attendees delved into the details: the scale of the problem (New Jersey generates an estimated one million tons of plastic waste per year; the state of the research (detailed, but in the very early stages); the economic and policy implications (tangled); and potential solutions. The scale of the problem is being measured in New Jersey’s waters by a number of academic research teams, some of whom presented their results at this conference. Dr. Ravit’s group, for example, after wading chest-deep into the waters of the Raritan River to collect samples, has identified 300 compounds, of which 73 were natural, more than 60 are used in labs or research, and the rest were additives in flavor, fragrance, and cosmetic products. Tracing these back to the sources is one of the huge tasks still to be done. Another is evaluating exactly what impact these microplastics have on human health. It will take more than science, however, to solve the multiple issues of plastic waste. That’s why conference organizers also invited people to speak on sewage treatment, regulatory issues, environmental reporting, and the businesses of making and recycling plastics. TerraCycle CEO Tom Szaky says recycling is not the answer to waste, and unveils a new idea. In an energizing, upbeat keynote address TerraCycle CEO Tom Szaky challenged the audience to consider a different approach to trash. “I will argue that recycling is not the answer to waste. How to redesign infrastructure for durability instead of disposability is - because that’s the way the world used to be” before the disposable culture was normalized in the 1950s. Szaky then offered a preview of TerraCycle’s grand idea, dubbed “Loop”, which he had unveiled at the World Economic Forum in Davos and plans to launch in New Jersey in May. TerraCycle is partnering with some of the world’s biggest manufacturers of plastic-enclosed consumer products (Proctor & Gamble, Nestle and Unilever, to name a few) to institute a “circular delivery system” of reusable containers for common products such as ice cream, shampoo, and hundreds of other household goods. In the past, TerraCycle has drawn attention to the recycling issue by making eye-catching prom dresses out of disposable drink packets and a jacket for Stephen Colbert, made out of Dorito bags. 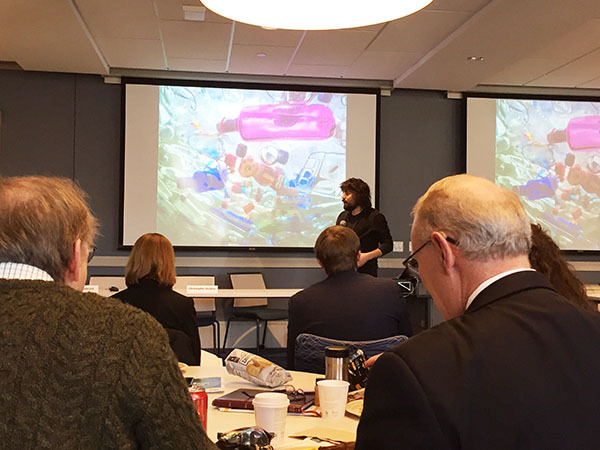 Other speakers at this microplastics conference have been working on solutions that involve repurposing plastic waste into functional items as strong as bridges and railroad ties. But there are considerable costs and contamination barriers to reusing trash. Well-intentioned efforts like single-stream recycling, for example, have had unintended consequences: while increasing the volume of collected trash, it also increases the amount of content that is so contaminated that it goes straight into landfills. Only 2% of plastic packaging currently goes back into plastic package production. “What happened to us?” decried one speaker, “Can’t we drink water without a straw any more?” All the more ironic that one presenter’s title should be: “The Lifecycle Analysis of Plastic” - since the whole point of the conference was that plastic never dies, a fact that we are just starting to come to grips with.